Thanks ABradox , i also thought it would be just this easy way . BTW thanks for your reply ! Thanks again for the help in PM . and of course with water shader and with my mod of mixed textures , well the game works perfectly fine , not even a bug or glitch or crash after 3-4 hours of playing . Glad you found that solution . Works perfectly with GTX 970 . Neutral got his point now . This version of RCF 1.6 are meant to be the "Replay" version with original cars , original colors . The idea is good to change the colors , but if you want any changes on this mod i think you just ask politely or write a PM to Neutral , maybe you guys can do some great work together in the next RCF 1.6 "Free Ride" version . The idea is good to change the colors , but if you want any changes of this mod i think you just ask politely or write a PM to Neutral , maybe you guys can do soma great work together in the next RCF 1.6 "Free Ride" version . I'm really sorry for that. I'm probably used wrong words when write my suggestion for next version of RCF. I'm sorry for my bad english. I do not want to instruct you or something like that. It's your project and only you decides how it be. Do you plan to make another taxi model in next version of RCF? In the next version, I would like to see more of the many taxis seen in the contemporary pictures in traffic. But there are many problems to solve about how it will work. There are ideas, but I need a team because I can not solve it alone. The goal is to see the new vehicles with rich variation on the road traffic as it is in the contemporary pictures were and be more lifelike. 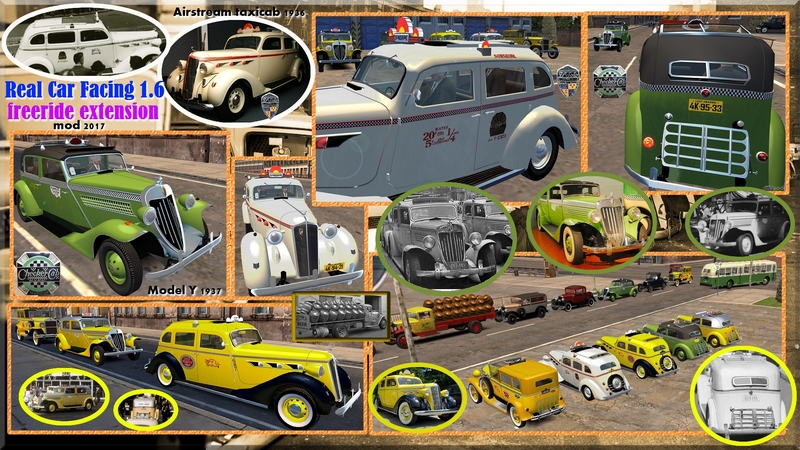 Now it is possible to apply the true colors of the cars regardless of the mafia, no need to observe the carcyclopedia because they will not show up there. fantastic job, i'm working in a classic garage in france and i love realism and orignal cars, so i'm verifying all thereal names of the cars, for example, the bugatti as is designed, is a type 54, between 1932 and 1934, with the left exhaust pipe. the power and the look is the 54, but we must change 4WD into RWD. It's not a 53 because it doesn't look like your bugatti. I think we can change the 4WD into the RWD with the RHAM 3.0. I'm looking for other models but main models are correct. For the Miller, It's a 1932 miller FWD (4WD), maybe you have already this name in your list. I hope you will show us your classic garage, it will be great. Really many good ideas are still possible in this extended freeride version, thank you for sending me. What I able to do will try to do it. In the enclosed picture I show the 3 type but 5 taxi company versions that are in the city as a separate model for the base cars with their own model name. Now I'm just making the new vehicles and then, when all is done, then will hot challenge that Tommy will be able to recognize the new cars and open and drive them. Currently they are on the traffic, but Tommy can only be a passenger. But if I put gangsters in the cars, they can be removed from car, then it becames as your own, and be repairable as the original game cars (but only this one not all of those types ). Interesting that in this case Tommy is able to recognize the new alien car again and again until you leave the freeride mission. Our team is also helped by my Golod55 friend, I hope we can solve this and other problems as well. While doing the missions after the Fairplay, when you can see a Lassiter V16 Phaeton, ai uses the Phaeton with Retextured Mod's textures. When I steal the car it converts into the RCF textures. How this could happen? Illusion Softworks (2k czech) and hangar 13 should hire you for a remake of Mafia !